The pictures on the front cover of the Parish Magazine this year were drawn in November 2003 by children at the Prestbury After School Club at St Mary's Junior School. This month's picture was drawn by Grace, aged eight years. February begins with the Feast of Candlemass. As we remember Our Lord being taken by Mary and Joseph to be 'presented' to God in the Temple, we take our last look back to Christmas and turn to look forward, particularly to Lent, Passiontide and Easter. The words of Simeon to Mary, 'and a sword will pierce your soul', are a reminder of the suffering Our Lord would undergo as he offered himself as a sacrifice for us all. As we take one final 'look back to Christmas' I should like to share something which I think should encourage us all. This year a number of people trudged round the roads in both Parishes delivering a Christmas card. Was that worth it we might wonder! I can prove to you that it was. I received a letter from a recipient of one of the Christmas cards delivered in All Saints' parish. The person wrote to tell us how touched she had been that someone should give up their time to deliver a card to her and she concluded her letter by writing, 'please be encouraged by my letter for the love that you are delivering through letter boxes'. If that was the reaction of one person, who bothered to write, we must be encouraged to think of how many more were similarly affected. Thank you to those of you who went out to deliver the Christmas cards! Now we must look forward. I write this at the beginning of the Week of Prayer for Christian Unity and immediately after the Consultation afternoon at St Mary's, attended by almost 80 people representing all three of our congregations in Prestbury. On 9th February, the PCC will meet to consider all the responses to the consultation which have been received so far and consider how we take them forward. One thing is very clear to me: we must move forward together, united in our love for God and our desire to share His most precious gift - the Good News of Our Lord Jesus Christ. For whatever reason, God has called us to be a Parish with two churches and part of a Team Ministry with a total of three places of worship. We must recognise the gifts we each have and use them and value them. And we must see that we can only be strengthened by being united, respecting and valuing members of all our congregations. Loving one another, as Christ has loved us. Lent is not just about giving things up, still less about being miserable. A Lent course can shine new light on our faith and the way we understand our own life. All this in comfortable surroundings with friendly company! This year we have two different options. 'Christ and the Chocolaterie' is based on the video of the film 'Chocolat'. It certainly starts from where many of us are - and you might be surprised at where it leads you. Wednesday evenings, led by Fr Peter Brown. Alternatively, the ecumenical course to be used throughout Cheltenham this year is entitled 'Faith in the Fire'; it features audio contributions from Rabbi Lionel Blue, Rev Steve Chalke, Rev Dr Leslie Griffiths, Ann Widdecombe MP, and the Archbishop of York, Dr David Hope. In Prestbury, I shall be leading one group at St Nicolas' Church Room on Tuesday evenings. If you would prefer a different day or time there will be several other groups throughout the town to choose from. In 2002, the General Synod of the Church of England took two steps which significantly changed the position of the Church on the issue of divorced persons undergoing a further marriage in church. In July 2002 General Synod passed a motion by 269 votes to 83 in which Synod affirmed that marriage should always be undertaken as a 'solemn, public and life-long covenant between a man and a woman'. However, the motion went on to recognise that 'some marriages regrettably do fail' and the Church has a duty of care for couples in such a situation, and also, 'that there are exceptional circumstances in which a divorced person may be married in church during the lifetime of a former spouse'. The motion then went on to state that the decision as to whether or not to solemnise such a marriage rests with the minister, who is required to follow advice issued by the House of Bishops. In November 2002 General Synod rescinded the Marriage Resolutions of the Canterbury and York Convocations, which had exhorted clergy not to use the marriage service in the case of anyone who had a former partner still living. The July 2002 motion could be said to represent the 'mind' of the Church of England on the matter of the remarriage of divorced persons in church. The November 2002 rescinding of the Marriage Resolutions removed the inconsistencies between civil law (the clergy's right to solemnise marriage) and the Church's official line against such marriages. Couples still do not have an automatic right to remarriage. The advice to clergy from the House of Bishops contained a number of issues and questions which must be explored during a series of confidential interviews between the couple and the priest. These include the reason for the breakdown of the previous marriage; whether there has been sufficient healing of the personal and social wounds of the marriage breakdown; the effect of a further marriage on families, individuals, the wider community and the Church; provision for children of a previous marriage; whether the couple have a clear understanding of the meaning and purpose of marriage. The decision rests solely with the clergy, although in our Diocese we are asked to inform the Bishop of our decision and can seek his advice if necessary. No member of the clergy can be compelled to conduct such a marriage. The advice from the House of Bishops suggested that clergy should consult with the PCC to seek its view on the matter. Our PCC discussed this issue at its meeting in November and was unanimously supportive of the process as it has been outlined. Couples where one or both have been married previously and who ask to be married in Prestbury will now be invited to meet with one of the clergy and to follow this process of discernment. It will be made clear to them that the process will explore some personal and probably difficult issues during a series of interviews. For the priest involved it will be a matter of trying to discern God's will for the couple. As a clergy team, we have agreed not to make a final decision on a further marriage without consulting one another. This is a change to a policy which had always refused the possibility of a further marriage, offering a service of blessing as an alternative. We are aware that for some people, who have in the past been denied the full marriage service, this change will cause hurt. For others it will be a cause for joy. We are also aware that some people will not be in agreement with such a change, feeling instead that the Church should be clearly upholding the view that marriage is 'life-long'. Although we are very uneasy about the role which the clergy will have to take in the process of discernment in each case, we feel that it is right that we should be able to respond more positively to couples who come asking to be married. Every case will have to be considered carefully and prayerfully. Every decision will have to bear witness to the affirmation by General Synod that marriage should always be undertaken as a 'solemn, public and life-long covenant'. Please hold the clergy in your prayers as well as all couples seeking to be married in our churches. The end of a village Christmas was excellently captured in St Mary's church on Tuesday 6th January - the Feast of the Epiphany. First we celebrated with the most important Feast, a sung Eucharist, with David Smith playing the organ. 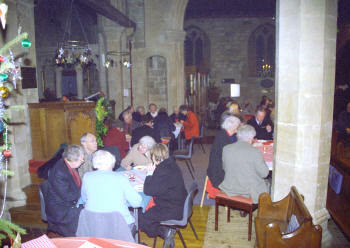 Next we enjoyed further fellowship over a hot home-cooked feast, sitting at tables squeezed in everywhere possible at the front of the nave. Finally we were entertained by Vital Spark, a West Gallery Quire from the Malvern area, who sang and played boisterous music such as we would have heard from the gallery at the west end of St Mary's 200 years ago, before the Victorians altered the church and installed the organ. The opening number was a setting of words from Isaiah 52:7 'How beautiful on the mountains are the feet of those who bring good news, who proclaim peace...' followed by an anthem from the Thomas Hardy manuscripts in the Dorset County Museum. We also heard two very different settings of 'While shepherds watched their flocks by night', which is a metric version of Luke 2:8-14. Sometimes the voices were in unison, sometimes in four parts (soprano, alto, tenor and bass), and were at times accompanied by violins, 'cello, clarinet, bass clarinet and a serpent. The music was vigorous and fun, deliberately raucous in places, and the Quire performed with an air of spontaneity which gave the impression not of a concert before an audience, but of a churchful of villagers all celebrating together. Thank you to Lynda and Roger Hodges for inviting Vital Spark, and to Shirley Brown and members of the catering team for organising the meal. How does one organize a supper for approximately eighty? I have a real problem with two and two halves! So first of all many thanks for a much enjoyed evening out; except for the washing up! The entertainment by Vital Spark was good but they certainly got better as the evening wore on. They managed very successfully to capture everybody's imagination with a rather rude 'musical' instrument called a serpent, which will become extinct fairly soon - with any luck! No one would suggest that Christians are shielded from the real issues and real pain that confront us in this life. The difference is in the strength and hope that we draw from our faith. The big question, however, is this - how can we best share our knowledge of the power and presence of Christ with those in our community who don't have that hope in their lives? This question is at the heart of a new initiative by the Mission & Outreach team - and it's one that we need your help to answer. On Saturday 13 March we shall be tackling this question - and more - as we prepare the way for a local Mission Action Plan. Everyone is welcome as we work together to find exciting and relevant ways to show people what the church is really about. The afternoon, from 2.15pm to 5pm, will be an informal (but intensive!) workshop-style event. Please put the date in your diary, and watch the pew sheets for more information, or get in touch with Jerry Porter or Caroline Sexton. We've had a busy Christmas with lots of ringing. 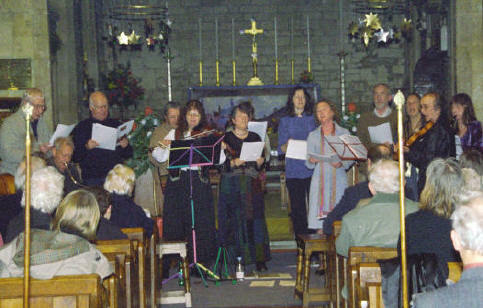 We managed to raise bands for all of the major services, including Midnight Mass on Christmas Eve and early Tuesday night ringing for the Epiphany Eucharist. The peal attempt on Saturday 27 December was not successful, although over two hours of pleasant ringing was achieved. Our New Year's Resolution is to continue to improve our standard of ringing and increase our repertoire of methods in 2004. Can you turn a short Bible passage into a poem which rhymes and scans? One classic example which we have all sung many times is Luke 2:8-14, better known as While shepherds watched their flocks by night. And I have found four versions of Psalm 23 in the New English Hymnal at St Mary's: The God of love my Shepherd is (77), The King of love my Shepherd is (457), The Lord my pasture shall prepare (458) and The Lord's my shepherd, I'll not want (459). Here are two passages for you to try: Luke 8:22-25 or Luke 18:35-43. Or choose a short Psalm, maybe 93, 121 or 150. Read the passage in more than one version of the Bible if you can, an old one and a modern one, to give you an idea of the different words that can be used to mean the same idea. Send me your poem by the end of February if possible. Don't worry if it is not quite finished, or if you can't fit the whole passage in. Having a go is what's fun, even if you think you can't write poetry! Please include your name, address and age (if under 16). It seems a long while ago - but an enormous thank you to everyone who helped with the annual Christingle Service at St Nicolas' on 21 December. 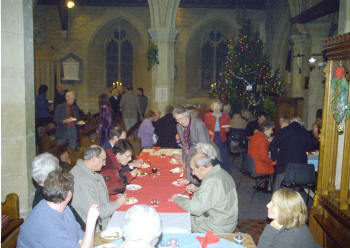 That includes, of course, all those who made Christingle oranges, and organised refreshments after the service. Thanks also to Tesco at Bishops Cleeve and Sainsbury's at Tewkesbury Road for the financial contributions that helped to cover the costs. We raised almost £100 for the work of The Children's Society. It was disappointing that more people didn't join us for this special event (perhaps we could organise a 'bring a friend' campaign next year! ), but those who were there had a wonderful time. The Christingle oranges that were left over were taken to the residents at Bay Tree Court. 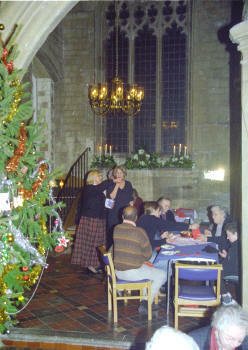 St Mary's Christingle Service was held on Sunday 14 December. We raised a total of £260 for the work of The Children's Society. Many thanks to everyone who supported the service and brought their collecting boxes to contribute towards the fund raising. Grateful thanks also to the team who helped assemble the Christingle oranges and to Sainsbury, Waitrose and Tesco who donated the fruit. We enjoyed a special service, which was led by Father Michael, with a lively, illustrated exploration of the symbolism of the decorated oranges from Andy Macauly, a thoughtful piece of drama from members of the youth group Elevate, some rousing carol singing and the atmospheric lighting of row upon row of candles - their orange holders clasped by the children, who filled the pews to bursting. Many thanks to our choirs and their friends who sang carols before Christmas at the supermarkets. St Mary's raised £115 at Sainsbury's and St Nicolas' raised £113.76 at Tesco's. Altogether £2280.68 was raised by all the churches who took part, a splendid total. raised the splendid sum of £136.50 which has been sent to the charity World Vision to help the poorest communities in the world. Thank you to all who participated. Thank you to all who bought and brought last year and raised so much money for our various charities (£362). The February stall will be held on Sunday 15th with contributions from members with surnames N - Z. The seating at St Nicolas has been rearranged. The PCC have recommended that this should remain in this format until Maundy Thursday. Prior to Maundy Thursday consultation will take place with the congregation. The Worship Committee will then review the arrangements in the light of this consultation, together with the plans for the forthcoming services during the Easter and Summer period, to decide any amendments. OK, so you've barely finished the Christmas cake! But, dare we say it, Easter will be upon us before we can blink - and that means starting to plan now! Our Christmas planning meeting, held in November last year, was very successful in opening the lines of communication, and ensuring that every detail was covered. Now we'd like to do the same for Easter! If you can help with the Parish Easter celebrations in any way at all please come along to the Rectory on Friday, 6 February at 7.45pm. Whether you organise an established Easter activity or event, have a new idea to share, or just an hour to spare! There will be a celebration involving pancakes on Tuesday 24 February in the Women's Institute Hall, Prestbury Road, at 7.30pm. For further details please see the weekly pewsheet in church or contact Lynda Hodges. There will be a Confirmation Service in Gloucester Cathedral on Friday 4 June 2004 at 7.30pm. We hope to run preparation groups for Confirmation and intend to begin them in the New Year. There will be two groups: a group for young people who are secondary school age and a group for adults. Precise dates and times will need to be agreed amongst the group members. Our Quiet Day this year will be on Saturday 6 March. Put the date in your diary now, and look out for further details.